Unplayable under Windows 10 due to serious graphical glitches, check Issues fixed for a solution. The GOG.com version (all languages) has been fixed since early October 2018. Russian versions have a simple disc check. All other versions are DRM-free. See Launch.exe does not work on the Steam version. 4:3 aspect ratio only. Selecting a 16:9 resolution will only 'stretch' the image. Select a 4:3 resolution to see the correct aspect ratio displayed. 4k resolutions can be selected, but it will be a stretched 4:3 image. Game limited to 60 Hz refresh rate in some cases. Mouse buttons cannot be bound to commands. Mouse buttons work but no cursor is visible while in menus. Game does not use the mouse for gameplay. Running cheat mode will not allow the game to save the launcher resolution setting. Common issue is white block in menu, and the blue characters models on white backgrounds. Download these files from dropbox. 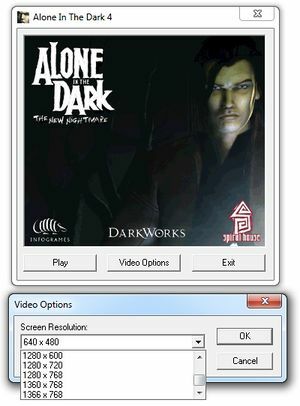 Replace the original alone4.exe with the .exe from the Spanish GOG.com version. Put the LOC_##.COK file on the Provider folder and rename it to Locale (Don't forget to DELETE the .COK extension). Extract any zip archive to the game dir. Renaming is not necessary. Sometimes running High Quality means the movie video becomes disabled. Set launch.exe and alone4.exe to run as admininistrator. Set alone4.exe to run in compatibility for Windows 2000. Launch.exe does not work on the Steam version, preventing you from adjusting the resolution from the default 640x480. The following is a corrected version of launch.exe for Steam. It also comes bundled with a partial fix for the game not running on Windows 8 or 10, as well as higher-quality movies ripped from the Dreamcast version. 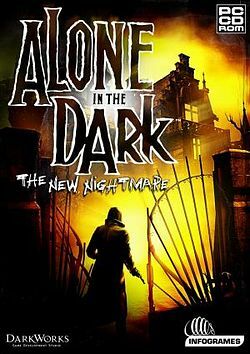 Download Alone In The Dark TNN Fixes & Cutscenes. Delete the movies folder inside the installation folder. Extract everything from the archive into the installation folder and replace as necessary. Run the game directly through launch.exe instead of launching it through Steam. Edit the shortcut and replace launcher.exe with alone4.exe. Add the wizardmaster command line argument. ↑ 1.0 1.1 File/folder structure within this directory reflects the path(s) listed for Windows and/or Steam game data (use Wine regedit to access Windows registry paths). Games with Steam Cloud support may store data in ~/.steam/steam/userdata/<user-id>/259190/ in addition to or instead of this directory. The app ID (259190) may differ in some cases. Treat backslashes as forward slashes. See the glossary page for details. This page was last edited on 2 April 2019, at 19:52.